Hello everyone, Today is all about kids, children, grandchildren, niece, or nephew, whatever the label you choose it's still kids. When do you teach them to sew? Should they be started with a needle and thread? 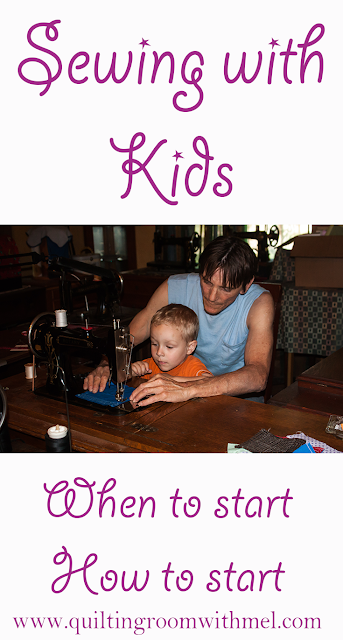 Or should they be taught how to use a sewing machine? What kind of machine do we teach them with? When do we let them touch the scissors and the pins? The list goes on and on,as quilters it's up to us to encourage the next generations who will follow our footsteps. Regardless of type of sewing, quilting, or garments you pursue or the type machines that you use sooner or later you may be involved in the process of teaching kids to sew. Treadles and handcrank sewing machines, vintage motorized or all inclusive latest greatest electronic wizbang sewing machines.So many choices,Where do you start? Here are a few of my own personal opinions solely based experiences I've encountered and things that I have learned simply through the ageing process. I believe there are multiple ways of dealing with children throughout their formative years. Since we are a society of individuals, it would serve us well to remember that children are also individuals. Their needs and interests will vary just as much as adults. So will their skills and maturity. So there really isn't a blanket answer suitable for all kids at any given age group. Here in the quilt room our grandsons are ages 5 and 3. 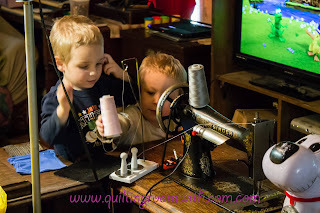 Both boys, they are very both very inquisitive about the treadle machines they like to watch them operate and help us sew. I have been giving a lot of thought into building a a shortened treadle stand to accommodate for the short legs and turning them loose on it. Until then they seem to be extremely happy using one of my handcrank machines. I don't give them free reins when they sew. I'm very much the hands on grandpa. They like the physical control they get by doing it by hand and they like the interaction with grandpa. The youngest of the two will be the maintenance tech, while the oldest will more likely be the designer some day. So for our particular situation, starting them on a handcrank is only natural. But a handcrank machine to a kid who watches adults use an electric machine may not be a good choice, much like expecting them to get excited with a needle and thread without having a mentor look up to, They are curious and they like to do the same things as adults. When we work with other children who find the older machine fascinating but not really their cup of tea, so to speak, we often opt for one of the vintage machines. Usually we don't try to promote one brand over another but we do find that the older Kenmores from around the 60's seem to be a little more forgiving to error and usually stitch a little slower. We usually pick out a fairly basic model with as few distractions and stitch combinations as possible so they will overcome the initial intimidation fairly quickly. When they have mastered the techniques limited by the stitches available then we move them up to a machine with more stitches and options. Usually by this time they will have a good idea what type of machine they really want to use and from that point it's really out of our hands. As for when to start them with the scissors it really depends on the kids and their skill level. If they can follow a line on paper and their scissor skills allow them to cut a curved line then we give them them the fabric scissors and fabric and let them go.We measure and mark and they cut. If the skills are clumsy then we will keep them practicing on paper until they are ready to make the move to simple cuts on fabric. So far we have not taught the use of a rotary cutter. But when the time comes I am sure that the way I teach will be safer than the way I cut. They will learn with no-cut gloves or they will use the scissors. I learned my skills through years of other working situations and then transferred them to using a cutter,so I am not so good about wearing the gloves. When it comes to using the pins my biggest concern is keeping track of them. I don't think it will do serious injury to a child if they poke themselves with a pin or two, but I don't wear shoes when I am sewing. Regardless of the machine being used I prefer to be sock footed or barefoot. I feel more in control when I can feel every thing under my foot. So it is a very sad day when I get a pin in my foot. I keep very close tabs on pins and I routinely sweep a large magnet over the floors in the sewing and cutting areas. I also hate brass pins. Basically, it is never the wrong time to teach if the student is interested in learning. Let their interest be driven by their curiosity and teach them according to their maturity level more so than their age. Keep it fun for them and don't push it at them. Let them learn at their own pace and hopefully they will in turn find themselves teaching the same way they were taught and the joy and thrills will have been passed to another generation. .
Love it! I've taught all 5 of my kids (4 girls & 1 son there at the end) how to hand and machine sew. I think they are better drivers later on , due to the hand-eye coordination and foot pedal use. Plus, knowing how to mend, sew clothes, adjust clothes for style or modesty, make quilts, and generally be adept on a moving parts machine is a really good skill to have in life. Our kids were started out pretty young as well ~ a 3 yr old can manipulate scissors for paper dolls and it's fun!